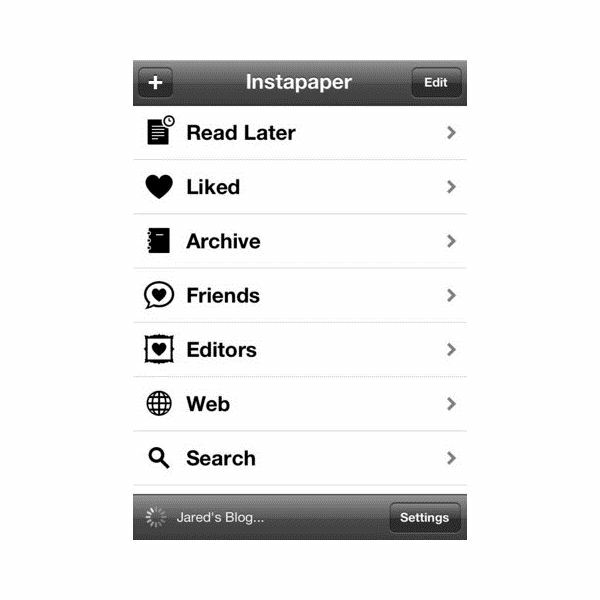 Like so many online services these days, Instapaper began life on the Internet and in your web browser. The idea behind its development is to bookmark interesting content you happen upon as you surf, but don't have the time to read right now. Hitting the "Read Later" button ferries this fascinating slice of the web off to your Instapaper account, so you can sit down later and read through a customized digital newspaper compiled by yourself. The Instapaper iPhone and iPad application is an extension of the online service, allowing you to access your account directly from your portable iOS device. It primarily aims to couple with an existing account, so you can tag new content regardless as to whether you're browsing on your desktop, at work, or on the go — and it's all there waiting for you when you finally have time to digest all this delicious information. 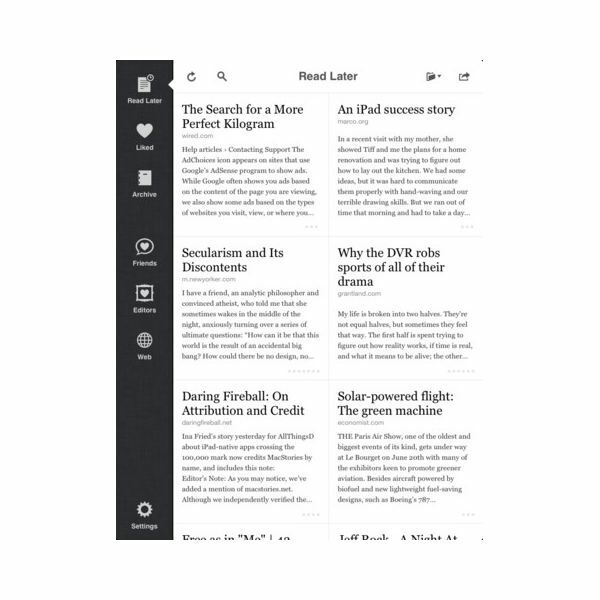 Previous versions of the Instapaper app worked well on the iPhone, but left iPad users feeling a bit like they were being fed a full-screen version of a smaller application. Version 4.0 of Instapaper changes all that. One of the major changes is the way your Instapaper content is displayed — and accessed — on the iPad, so that's where a review is primed to begin. After all, Instapaper is a personalized newspaper, and now it looks very much like a traditional broadsheet when your content fills up the iPad's screen. A grid view has been implemented for the larger iOS device, offering up a title, article credit and substantial preview of the included text for each article saved to your Instapaper account. If you're a fast-clicking "read later" surfer, as we are, this new view will prove to be a significant benefit, as it's often hard to remember clicking some of those articles, so the automatically generated grid preview is a great reminder of the content included. And just like the web service, the Instapaper app does a great job of stripping the content you want while still maintaining simple, fast access to the original publication. Again, this feature is particularly well suited to iOS reading, given that many web pages contain elements that either won't load on an iPad or iPhone, or take a long time to display when dragging them over the cellular data networks. Strip it back to raw text, and you're reading in seconds. It's unlikely that you're going to be reading Instapaper content on an offline computer, but iPhone and iPad users will really appreciate the application's ability to absorb the articles you want to read, distil them into pure text and save them to your device for reading later. An iPhone has regular Internet access, but few iPads have anything more than Wi-Fi (and this goes for the iPod Touch, too), so offline reading is a major aspect of the Instapaper app. Log in to your account on the device before heading out the door, and all your curated content is pulled in. Given that this is mostly text, storage space is barely an issue, but having your account stored on-device means you can dip in and out whether there's a Wi-Fi signal or not. It's a seamless operation that requires no effort or monitoring on your part, making it great for the commute, air travel, or anyone working in a nuclear silo. NOTE: Not to be confused with a badly photocopied socialist newsletter. The new Instapaper app adds a significant social element to your reading habits, allowing you to not only grab content from the likes of Twitter and Facebook, but to make your "read later" data known to friends and followers. The control column on the left-hand side of the app now features a "Friends" button, which allows you to tag other Instapaper users who have similar — or particularly interesting — tastes to yourself. Follow them to be kept abreast of what they're reading, while your own followers dip into your own library to see what's caught your eye. Admittedly, you might not be too keen on opening your reading habits to the scrutiny of others, and although you have the option of whether to be sociable or not, it's sometimes a little difficult to appreciate how this feature ties into Instapaper's core remit. Given its offline, "read later" approach to web content, online sharing feels more like trend following than a vital new feature. That said, the editor's picks section is very welcome, as it offers a hand-picked selection of Instapaper's current most popular stories. If you're looking for a feature that brings in the world news without you having to search for it, hit the "Editors" button. If you're already an Instapaper user on your iPhone or iPad, then get the free 4.0 update immediately. It's the app that Instapaper always wanted to be, and really feels like it brings the online service home. Newcomers will already know if this is an app they're going to get use out of. When we ask if you often see content on the web that you intend to read later, but never get around to, then Instapaper is the service — and application — you've been looking for. There are over 150 iOS apps out there that already hook up to your Instapaper account, and thanks to the Instapaper app for iPhone, iPod Touch and iPad, reading your content is now as easy as gathering it.